Rob & Miss Jane are both very excited to give their clients a unique and memorable show experience. Having performed in over 35 countries in venues all across the globe, Rob & Miss Jane understands the need for an engaging and thrilling performance that can be understood in any language! Filled with comic dance numbers, juggling, circus acts and classic physical comedy, we offer two different full-length shows to meet your entertainment needs. We can also break down our performances into shorter routines to be a part of a variete, revue or circus ensemble. Street Festivals, Theater, Cruise Ships, Resorts, Circuses, Revues, Cabarets and More! Our shows are fully customizable! ROB JANE is a fast-paced interactive comedy of costume quick-change magic, dance, juggling and slapstick stunts. Understood in any language, ROB JANE will leave their audience in stitches with their comic sight gags and visual humor. Don't need a full length show? 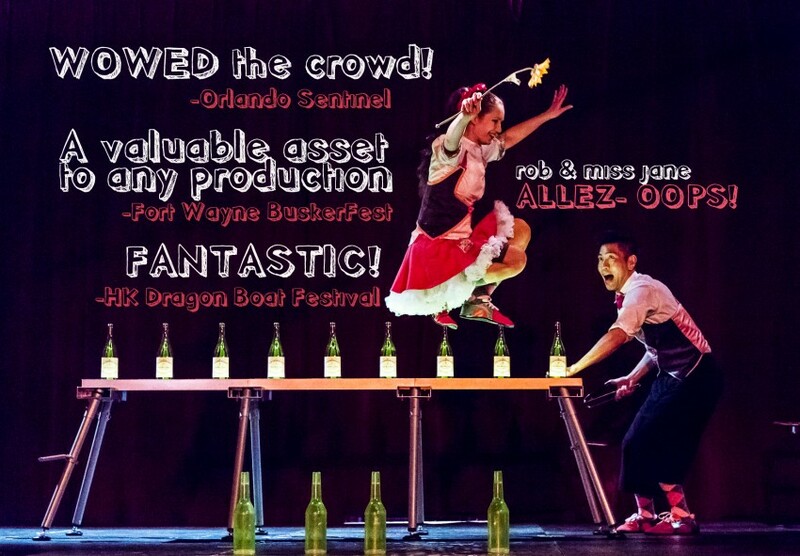 Rob Lok & Jane has a variety of different short acts that can be presented in a circus ring, gala, revue show or variet format. A hit at the renowned World Festival of Clowns in Yekaterinburg, Russia, "It Takes Two" is a comic dance twist on the classic quick change costume routine. "Kubok" is Russian for chalice or in this case, cups. This cup juggling and manipulation routine highlights technical tricks with comic flair! "DYNAMO" has NEVER been done by anybody else! Rob Lok is the ONLY artist in the world that does this routine. 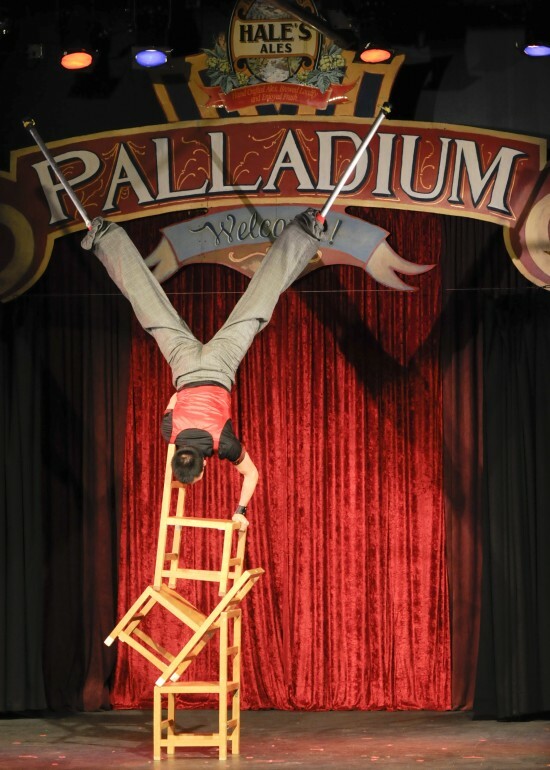 The combination of stilt acrobatics and slapstick comedy culminates into the ultimate finale, The Stacking Chair Stilt Handstand! Even though Rob Lok was born and raised in New York City, he considers himself a citizen of the world after performing for almost twenty years across the globe. Some memorable experiences include working with children in refugee camps in Kosovo under the watchful eyes of armed soldiers and seeing boys and girls join together in laughter as Rob performs one of his comedy acts in Andkhoi, Afghanistan. 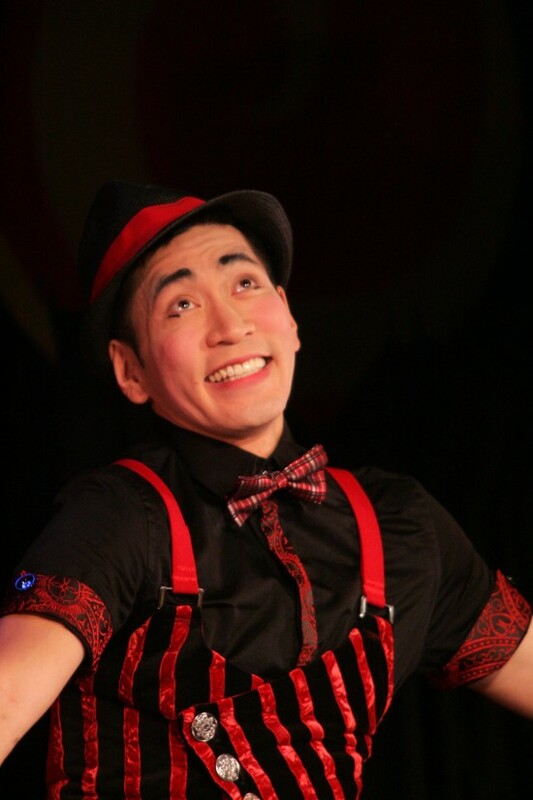 Rob Lok has the honor of being the first American-Chinese graduate of the acclaimed Ringling Bros. and Barnum & Bailey Clown College as well as the first American-Chinese clown to perform in a circus ring in Russia. *Russian translation: Rob Lok & Jane has it all! Geniia Pokrovskaya is an award-winning dancer, teacher and choreographer of belly dance in Kiev, Ukraine. Since 2008, she has trained new dancers in Kiev at her studio "Rahat Lokum"
Geniia is also a well-respected judge for the many dance competitions that takes place in the Ukraine. The Pokrovskaya Family is responsible for building many of the special costumes used in Rob Lok & Jane's performances. In addition to her dance training, Ms. Pokrvoskaya holds a degree in object-oriented programming from the Kiev Polytechnic University.